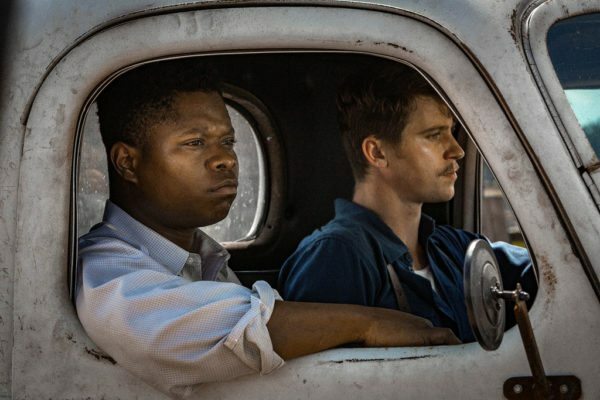 Starring Jason Mitchell, Garrett Hedlund, Carey Mulligan, Jason Clarke, Jonathan Banks, Kerry Cahill, Rob Morgan, Kelvin Harrison Jr., Lucy Faust, Henry Frost, Dylan Arnold, David Jensen, Geraldine Singer, and Mary J. Blige. It is undeniably perplexing that a person, regardless of any race, gender, or sexual orientation, can willingly enlist and fight in a war only to come home treated like mud. 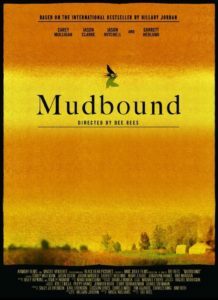 There are a lot of intertwining stories going on in Mudbound (a film directed by Dee Rees and adapted from the novel by Hillary Jordan that is so timely and powerful, I feel ashamed for not having seen her other breakout work Pariah yet), complete with frequent voiceover narrations from six different characters (admittedly, some of it is unnecessary and too much, despite their poetic qualities penned in by writer Virgil Williams). It’s an ambitious concept that many veteran directors, let alone rising filmmakers, would fumble into an indescribable mess, except that doesn’t happen here; members of families both Caucasian and African-American feel real and with purpose, all connected to the bigger picture at hand. Strong work from a terrific ensemble aside, Jason Mitchell’s (Straight Outta Compton) Ronsel, a black crop sharer living in a claustrophobic shack surrounded by the poverty-stricken Mississippi Delta (artistically and painfully captured with plentiful lighting variations by cinematographer Rachel Morrison), is the heart of the narrative. As previously alluded to, he takes up arms against the Nazis as a sergeant in control of a tank to escape extreme racism. Naturally, his compadres seem to treat him equally, which makes sense considering that not only are they on the same side, but they are protecting each other’s lives. 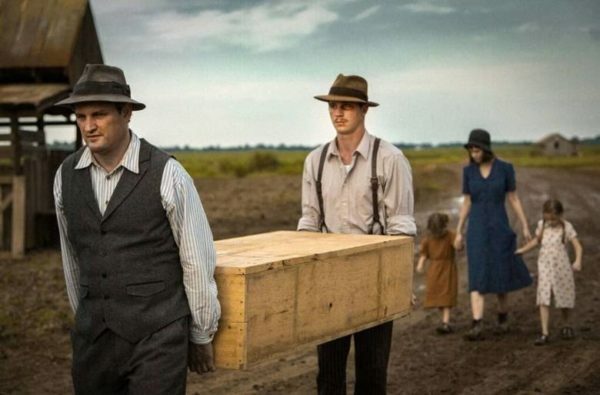 That’s not what will catch Mudbound audiences off guard, and it also isn’t the dramatic juxtaposition depicting life on the struggling farm and his symbolic presence observed as a hero on the battlefield by other countries. There’s a subtle interracial relationship out in the open with a European woman, and even though, it doesn’t receive much screen time, it over time builds into the most compelling story arc. No spoilers though. Ronsel does return home from the war, befriending a fellow compatriot, B-25 pilot fighter Jamie (Garrett Hedlund who goes from energetic and lively to drunkenly depressed and distraught after his time in the sky), by mere happenstance. Each family contains three critical adult characters, and of the whites, Jamie is the only progressive one of the bunch (discounting toddler children). His brother Henry (Jason Clarke) isn’t overtly racist but clearly doesn’t view his black land leasers to be on equal footing, while the brothers’ father Pappy (Breaking Bad‘s Jonathan Banks) is the traditional hate-filled soul. So, as Jamie reaches out to be Ronsel’s friend (he offers him car rides in and out of town along with sips of his alcoholic beverages) based on mutual respect, it stirs trouble within their families and the community. 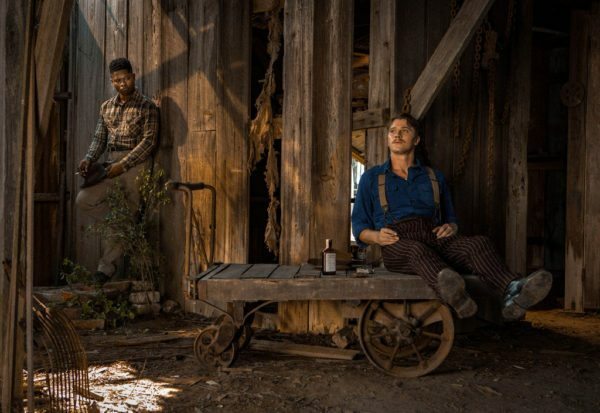 By far, the best scenes in Mudbound (aside from the explosive final act) are the serene bonding moments between the two lost fighters; their brewing friendship never feels forced or inauthentic. War has transformed them into broken human beings that identify more with each other than their own flesh and blood, smashing down race barriers. Specifically speaking about Jamie, he makes a few other decisions that have quite the impact on certain characters, although the most engaging drama always comes from Ronsel’s journey. Truthfully, if there is an area where Mudbound slightly falters it’s with the females, which is completely unexpected coming from a female director. Carey Mulligan plays a 31-year-old virgin named Laura that marries Henry even though narration tells us she isn’t very fond of his personality. Ronsel’s mother Florence is played by R&B musician Mary J. Blige, and the extent of her character is essentially worrying about her son. 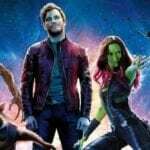 Both actresses are still gripping with the material they are given, but their storylines occasionally feel superfluous, tacking onto a lengthy 2+ hour running time. The same can also be said for Ronsel’s father, although as the patriarch, he gets more brimming racial tension to play out with the white family. Still, the slow-burn does exist for justifiable reasons. Thanks to some sharp editing, we also get to see some superbly crafted wartime sequences, both from on-foot and aerial perspectives. There is also no holding back from the horrors of battle, showcasing some gruesome deaths and intense peril. Furthermore, the graphic violence should be applauded just to showcase how sanitary it feels in comparison to things toward the end of the movie that should be experienced firsthand. Credit again goes to Rachel Morrison for absorbing visuals during these segments along with the direction from Dee Rees that does more than enough in a short amount of time to make the following PTSD symptoms genuine and easy to empathize with. There may be filler in some areas of the film, but Mudbound crushes every important aspect. Screenwriter Virgil Williams was on hand for the festival screening of the movie, and mentioned that the Mudbound novel has a nonfictional but historically educational presence to it in the vein of all-time classic novel To Kill a Mockingbird, which is something I’m inclined to agree with as I was thinking that same sentiment watching the film. Sadly, although progress has been made, this presentation of America is one that is still prevailing in today’s society, rendering Mudbound a must-see picture. It’s about two families literally and figuratively stuck in the mud, where love is the answer and not irrational disdain based on prejudices. The film could easily be remade to fit modern times, which is disappointing. 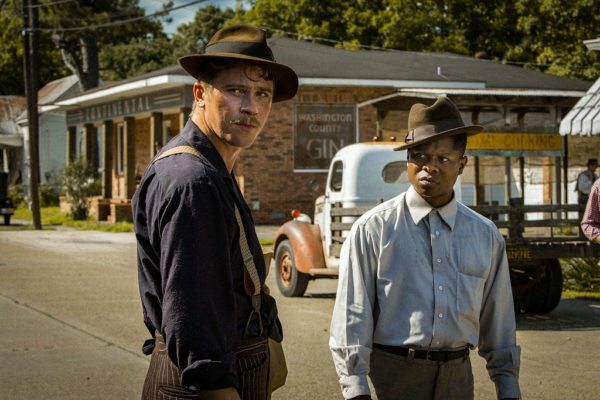 Mudbound is simultaneously devastating and uplifting.